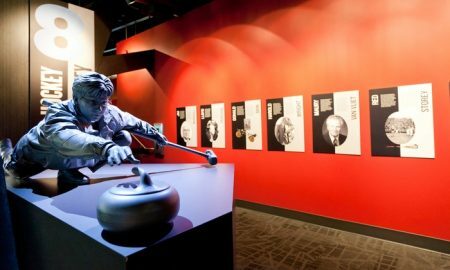 In its 40,000-square-foot space located at Canada Olympic Park, Canada’s Sports Hall of Fame chronicles hundreds of unforgettable sports stories. With 12 galleries and a collection of over 95,000 artifacts, the sprawling museum—which opened at its new location in 2011—has room to represent the greats of just about every sport in the country, from boxing to curling to auto racing. In addition to countless authentic artifacts, displays also boast interactive features; visitors can look at Dr. James Naismith’s original diagrams of basketball plays or feel a fastball crack into their mitt in the 3-D “Be a Catcher” experience. An 11-minute feature highlighting memorable sports moments plays in the 120-seat Riddell Family Theatre, letting guests relive historic games and the feats of championship teams. Promotional value expires 360 days after purchase. Amount paid never expires. Limit 2 per person, may buy 2 additional as gift(s). May be repurchased every 180 days. Merchant is solely responsible to purchasers for the care and quality of the advertised goods and services.